Last week the Girls Varsity Soccer team competed in the Highway 5 Tournament in Melissa and Anna. On Thursday, the girls beat Paris 4-0. Goals were scored by Hannah Dunlap, Reagan Matacale, Jessie Maashio, and Tatum Chester. The goals were assisted by Chester, Matacale (2), and Dunlap. 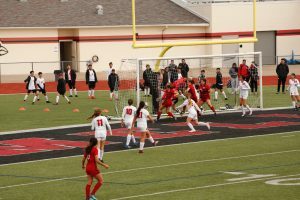 On Friday, the girls played Argyle and won 2-0. The first goal was scored from the penalty spot by Reagan Matacale after she was fouled in the box. The second goal was scored by Sadie Dale after an assist from a header by Emma Landry. The team was set to play Melissa on Saturday but the game was canceled due to weather. In the tournament the girls earned their first two clean sheets of the season thanks to players who get less recognition than those that play further forward and score goals. Kamri McKnight and Hailey Downing played well in goal coming up with some important saves. Solid play defensively from Andee Richardson, Lexie Schuttee, Conley Miller, Bella Ospina, Avery Templin, Jordan Watson, Bella Kusgen, Chloe Brown, Sydney Fluker, and Katie Welch restricted our opponents chances and kept them from scoring. The team is now 6-1-1 heading into the last three games before district starts!! Next game is on Tuesday at 7:30 at Naaman Forest High School.